November saw a host of world-renowned artists take to the stage at Porchester Hall, performing at a number of charity events, gigs and concerts. On 1st November, Pancreatic Cancer UK hosted their annual charity event at Porchester Hall. Around 400 guests were treated to an extensive three course dinner, whilst the likes of Emelie Sande, UB40 and Suggs, performed. With guests fundraising throughout the evening, the charity raised an amazing amount of money and the event was deemed a huge success. Porchester Hall offered exclusive behind scenes filming access for the BBC Children in Need series. Setting the backdrop for auditions, members of the public arrived at the venue ready to perform for a panel of judges, only to be surprised mid performance by their favourite artists, including Olly Murs, Little Mix, Craig David and Sheridan Smith. Absolute Radio hosted their annual party this month at Porchester Hall, running a private function for lucky fans and employees. Snow Patrol took to the stage, playing a number of their famous hits and putting on a real show for all attendees. 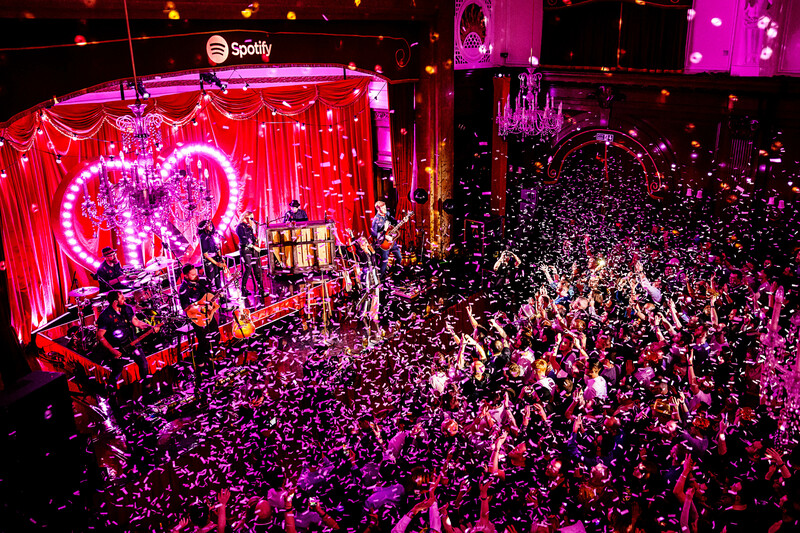 Back in March, Spotify hosted a special, intimate gig for die-hard fans of Kylie Minogue too. The artist played her music tracks to 300 of her closest fans, giving them a sneak-peak of songs on her newest album. Porchester Hall made the perfect, art-deco backdrop to Kylie’s gig and fans walked away from the evening having loved every minute of it. The facility is set to host a number more functions before the end of the year, including the annual Urban Music Awards on 29th November..
Porchester Hall is ideal for larger gatherings, charity dinners and intimate gigs. To meet the events team register to attend the next London Summer event Show on 22-23 January 2019 at Banking Hall.